Team Fortress 2 is notorious for crashing whilst you are playing the game. 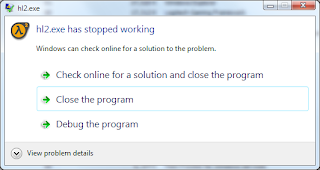 In some cases, it will crash to desktop with an error message stating hl2.exe has stopped working. In other cases, the game freezes for a second, loops the sound, and then minimizes itself to desktop without the ability to switch back to it and when this happens you can hear sounds from the game, but other than your desktop, you can't see anything in the game. When this happens, you have to open task manager to forcefully end the team fortress 2 process. The above may or may not fix your hl2.exe error. I found a possible fix for the game going see-through, can see my desktop but not use it, and the game keeps running with sounds and people complaining about you not moving. Find the hl2 exe in the team fortress folder and change its compatibility settings to disable "desktop Compositing" and "visual themes"